In the Spring of 1708, the "Monthly Miscellany" or "Memoirs for the Curious" published a letter from Bartholomew de Fonte, the “then Admiral of New Spain and Peru, and now Prince of Chile,” describing the author's discovery of a Northwest passage from Hudson's Bay to the Pacific. "This apocryphal account is now attributed to the editor or owner of the London magazine, James Petiver. There is no reliable evidence to authenticate either the existence of de Fonte himself or of the voyage." (Ireland, Willard E. Fonte, Dictionary of Canadian Biography, http://www.biographi.ca/en/bio/fonte_bartholomew_de_1E.html, accessed November 23, 2014). But de Fonte's fictitious discovery was embraced by distinguished French mapmakers, including Buache and Delisle, and became the centerpiece of this map by Zatta. In fact, Zatta's map includes at least two other fictitious western discoveries: those of "Cap. Cluny Inglese" in the far northwest and Baron Lahontan's "Long River" from the Mississippi through the Rockies to the Pacific (here the "Grand River Flowing to the West"). And it locates with precision - at what appears to be Vancouver - the site of the mythical 5th century "Fou-Sang Colonia del Chinesi." See Suarez 2004, 26-27. 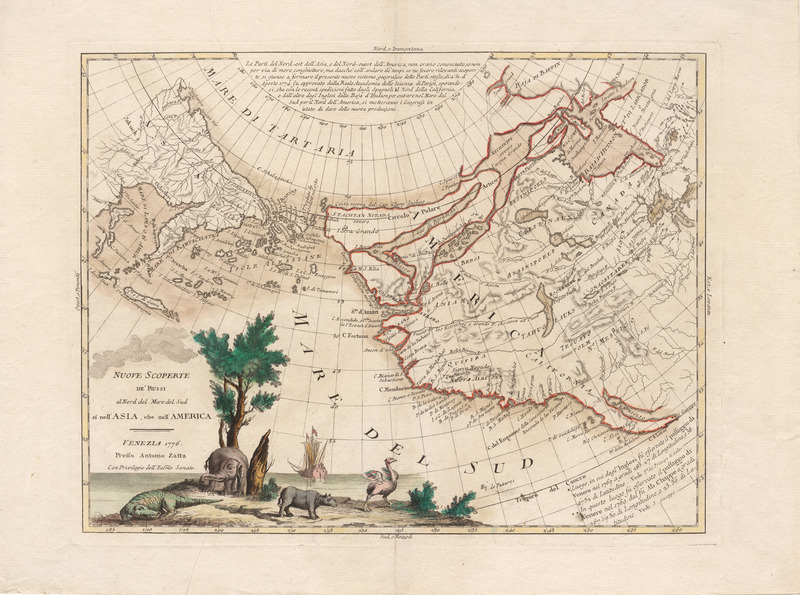 Dominating the map is a fanciful cartouche of an island populated by animals entirely foreign to the north Pacific: a crocodile, an elephant, a baby rhinoceros and an ostrich!